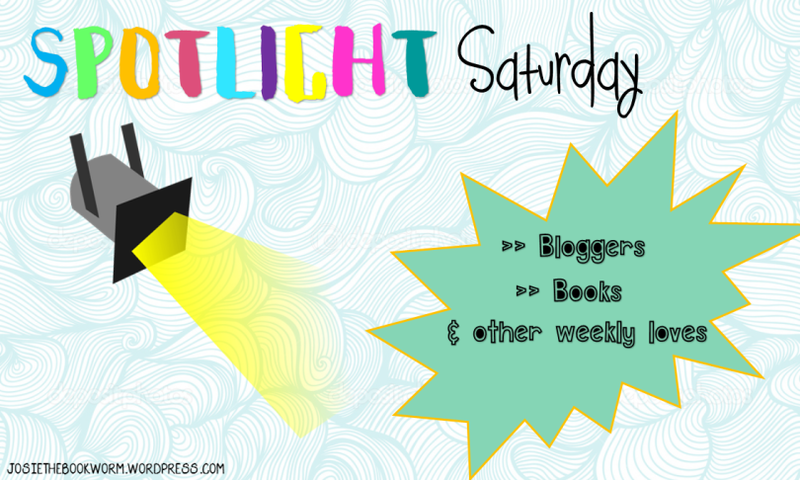 Spotlight Saturday is a weekly feature, created by Josie at Josie’s Book Corner, dedicated to spotlighting and pinpointing some of the things over the week that have caught my attention more than usual, things I’ve particularly loved, etc. Lately I have been falling behind of on some of my favorite bloggers, but I have been keeping an eye out for a specific one. This week I want to give a shout out to Cristina over @ My Tiny Obsessions. You guys need to seriously go check out her stuff! Not only does her blog look amazing with its simplistic yet beautiful design and theme, but she also produces some great content as well. I love her reviews and especially her reading tastes. But she doesn’t just post about books, she also talks about movies and TV shows! Again we have such similar tastes in TV and movies as well. As many of you probably already know of this blogger, you shouldn’t be surprised that her most recent blog post, How Much Realism Should We Expect from Fantasy Fiction? is the one I’m spotlighting this week. It is by none other then Aentee from Read at Midnight. She brings up a really good point when it comes to fantasy novels. How real should they be? I get that when you read a fantasy novel you do so to escape from the real world and take a journey into one so unlike your own. But Aentee goes as far as to question some authors choices. Shouldn’t their fantasy worlds be binded with some law and rules to keep it from becoming too absurd? When do we come to realization that some things just don’t make sense in this fantasy world? It really put things into perspective for me and I will definitely be keeping an eye out for the totally absurd aspects of the fantasy novels I’ll read in the future! As I am in a time crunch this month to finish quite a number of books before September, I could spotlight quite a number of books right now. But I feel one is standing out from the rest at this moment, and that is The Secret Heeder by Fleur Camacho. It is the second book in her time traveling fantasy series TRISTEN. I have been a fan of Fleur’s writing after reading The Last Seeker earlier this year, and have sparked a friendship with her since then. So with great honor as the release date of The Secret Heeder is approaching, she has given me an e-ARC to read for review! I can tell you guys that this series deserves more love. It’s very unique, the characters are lovable, and the story lines are fantastic. I highly recommend you guys go pick it up, I’ll link the GoodReads pages above! As many of you may know, I hosted a giveaway last week for a signed copy of A Book of Spirits and Thieves by Morgan Rhodes! Well with much success it has come to end yesterday and a WINNER was chosen. I couldn’t have been more pleased with the outcome and how successful it turned out. I want to thank everyone who participated and I couldn’t be any luckier to receive all the warm comments this whole past week. It gets me really excited to host more giveaways which may turn into a monthly recurrence for me! Would you guys like more giveaways? You’d be crazy to say no. There is so many great apps out there! But the one I have been using religiously over the last month has been Audible. For those of you that don’t know, Audible is an app that allows you to listen to over 150,000+ audio books from best sellers to your favorite guilty pleasure reads. For those who can’t find time to read a physical book while commuting or doing other tasks, Audible is a great resource to use. You can listen to Audible audio books in your car, on the train/bus, walking/jogging, while you cook, while you shower, right before bed etc. If you haven’t experienced an audio book before and don’t know if you’re going to like it or not, you can try out their 30-day free trial. So what are you waiting for, go check it out! So I don’t thing I have ever talked about music on my blog before which is a shame. Music is such a big part of my life that I don’t know what I would do without it! And my favorite type of music is KPOP! So the songs I want to spotlight this week are Lion Heart & You Think by Girls’ Generation. For those of you who don’t know who Girls’ Generation is, they are an 8 member South Korean pop group and Asia’s #1 girl group. They released their 5th album this week with two title tracks, the ones listed above. Going for the a retro vibe, Lion Heart is a catchy 1950’s/1960’s inspired pop track with addictive lyrics and a catchy dance. Check out the music video HERE! As for You Think, it is dark urban hip hop inspired track with powerful dance moves and impressive vocals and visuals. The music video for that song is HERE. I decided to take to twitter to find the perfect quote and I believe I found one that speaks true to my life! Well there ya have it guys! My first Spotlight Saturday post! Thanks again Josie for letting me join in on the fun. Tell me what you guys want to put a spotlight on, I would love to know! This entry was posted in Spotlight Saturday and tagged August, Fleur Camacho, Misc., Spotlight Saturday, Young Adult. Bookmark the permalink. Yes, I see that you quite enjoyed that book! YESSS! A SONE like me! Isn’t their whole album amazing?? YESSS, the album is so so so good!! Yay! I’m so happy to see you did this! Feel free to spread the word that they are allowed to do this feature as well. I’m going to put a little message on my blog as well letting people know. I loved Aentee’s post! It was so entertaining and very interesting to read. And as for Cristina’s blog? Absolutely wonderful. I love her blog too for all the reasons you mentioned and more! Audible is definitely a really awesome app! Trust me! I’ve been fanboying for KPOP since 2007! I was crushed hard when DBSK separated. And I keep up to date with all the new groups too! A lot of talented groups out there.